The following article by REUTERS is extremely significant for what it conspicuously does not report about President Putin’s reaction to the U.S. withdrawal from the climate pact. The Russians are not stupid when it comes to the real climate change issues. Russian scientists were the first to authoritatively document the macrocosmic causes of climate change. They are also quite cognizant of the profound influences that chemical geoenineering is having on (i) the increasing number and intensity of extreme weather events and (ii) the alteration of longstanding climate patterns. Much more importantly, Putin knows that the Paris Agreement is but a preliminary framework for a One World Government. The Kremlin is well aware that the “United Nations Framework Convention on Climate Change” (UNFCCC) represents a major advancement of the hidden New World Order agenda. What is quite telling is that Russia has also stealthily stalled the ratification of the UNFCCC. They know that, were such a fundamentally flawed international accord to take practical effect, the Russian Federation would go bankrupt in a day and a night. Of course, this is exactly what the NWO ruling cabal has planned for the Russia. So, what else does Putin do: he sends a coded message — via the MSM outlets — straight to the Oval Office. What he’s really saying in the article posted below is that the POTUS not only did the right thing, Trump essentially saved the world from a global economic depression. This secret relationship that exists between Presidents Putin and Trump is driving the Neocon warmongers absolutely nuts. Which is why Deep State has foolishly perpetuated the “Russian election hack” meme with such tenacity. They know full well that, were Putin’s Russia and Trump’s America to make common cause, peace would break out across the planet. And, Deep State’s perpetual war economy would cease to exist. ST. PETERSBURG, Russia — Russian President Vladimir Putin said on Friday he wouldn’t judge U.S. President Donald Trump for quitting a landmark climate pact, but said he thought Washington could have stayed in the agreement. 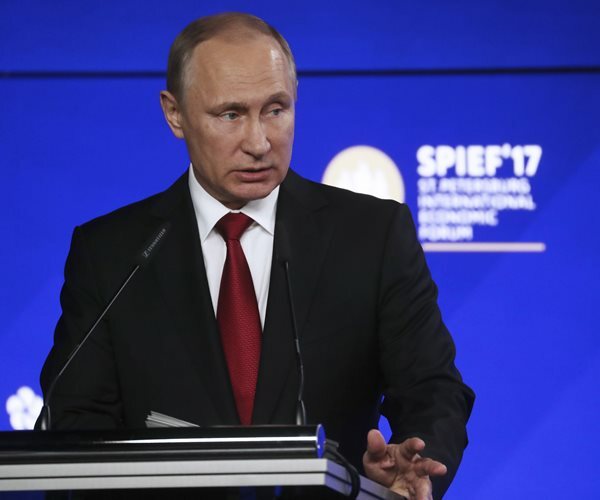 Speaking at an economic forum in St. Petersburg, Putin said the 2015 Paris accord was a good document, but that Russia had not yet ratified it because it was waiting for certain technical details to be settled. © 2017 Thomson/Reuters. All rights reserved.